This is scary, dangerous, and could’ve ended up with a man losing his life. 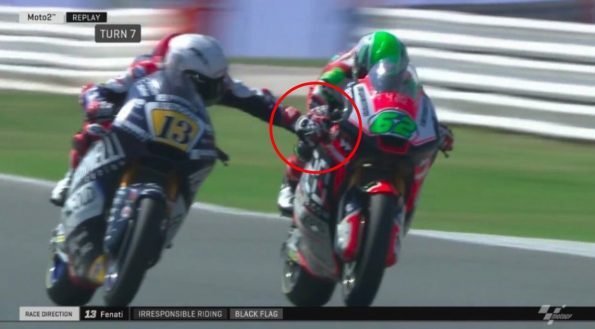 Romano Fenati was sacked by his Marinelli Snipers team following a disturbing incident where he pulled Stefano Manzi’s brake lever at 140MPH during Sunday’s Moto2 race in San Marino. The Italian rider was given a two-race suspension but has now had his contract ripped up. “We can communicate that the Marinelli Snipers Team shall terminate the contract with the rider Romano Fenati, from now on, for his unsporting, dangerous and damaging conduct for the image of all,” read a team statement. “With extreme regret, we have to note that his irresponsible act endangered the life of another rider and can’t be apologised for in any way. The rider, from this moment, will not participate in any more races with the Marinelli Snipers team. “This has been the worst and saddest thing I ever seen in a bike race,” Giovanni Castiglioni said in an Instagram post. “True sportsmen would never act this way. If I would be [MotoGP promoter] Dorna I would ban him from world racing. “This morning, with a clear mind, I wish it had been just a bad dream,” he said. “I think back to those moments, I made a disgraceful gesture, I was not a man. The criticisms are correct and I understand the resentment towards me. I want to apologise to everyone who believed in me and all those who felt hurt by my actions. Sadly, this is hardly his first incident as he made headlines in 2015 when he was penalised for kicking out at Finnish rider Niklas Ajo in a Moto3 warm-up in Argentina.